Manchester four-piece Everything Everything return with their much-awaited follow-up to 2010’s ‘Man Alive’ in the shape of ‘_Arc_’ (pun intended). As you might expect, they’re as mental as ever. It’s difficult to pin down Everything Everything in terms of sound or genre as they jump all over the place. One minute they can be a pop act, and the next they’re experimenting with bee-bop jazz. Everything Everything are the very definition of eclectic. First out is the single ‘Cough Cough’ with twitchy stop-start drumming and who knows what they’re singing about. Its rhythm and harmonies are infectious from the start and despite its utter madness, it is difficult not to sing along, even after only a couple of listens. Similarly ‘Kemosade’ follows with more big anthemic verses. I defy anyone not to shout ‘HEY!’ whilst listening to it in the street (I know I have). It’s just so satisfying. As with everything on this record, it’s the unconventional musical structure, the banality of the lyrics and the shameless falsetto vocal, that ‘just about’ work, making it sound fresh, new and something special. It feels like they’re taking a ton of risks, but pulling all of them off. ‘Torso Of The Week’ is as its title suggests about the search for physically perfection, juxtaposed against impending middle-age and (what sounds like) the resistance to settle. ‘Baby you’ve been hitting that treadmill like a freak’ sings Higgs, and later ‘You’re looking like you’re bored with your husband, You’re looking like you might have a question’. Another infectious chorus follows. Lyrically this is probably the most coherent track on the album. The tempo here is slowed, after the franticness of the opening tracks, hinting at something more delicate and considered to follow. Aside from the twitchy-pop Everything Everything are known for, they’re not afraid to attempt a ballad (of sorts) and ‘Duet’ is just that. Sounding more sincere, Higgs sings desperately ‘I don’t even know what’s going on, I don’t want to think about it all, I’m tired’ with every ounce of his soul. Despite their quirks, they can provoke a strong emotional reaction when they want to. Less well judged is ‘Choice Mountain’, which is another serious moment for this album, but one that feels a little too ambiguous for them. As much as Higgs high voice moments have their place, it can be a little over used, and you do wish he would just relax and tell a story instead of challenging himself to take risks constantly. The track is still fantastic, but in the context of what’s preceded, it does lose its way a little. ‘Feet for Hands’ is a high point for this record. With its strumming guitar and huge vocals it’s everything they do best in one track. This is the song that will stay with you after a couple of listens. It’s infectious, it’s epic, it’s almost perfect. So perfect in fact you may find an alternative version within the bonus tracks at the end of the album (which is also a joy). Title track ‘_Arc_’ (complete with underscores) is unsurprisingly the pivotal track on the record and weighs in at around two minutes, of essentially filler, right in the middle of the record. A lot of chaos has preceded it, and it feels like the second half of the record may offer something different. ‘Armourland’ is more electronic and features one of the most delicious eighties-sounding choruses you will have heard in a while. It’s an unapologetic tribute to all things glam and decadent in the early eighties, and if you listen hard enough you can actually hear some kind of robot on backing vocals. It’s that good. 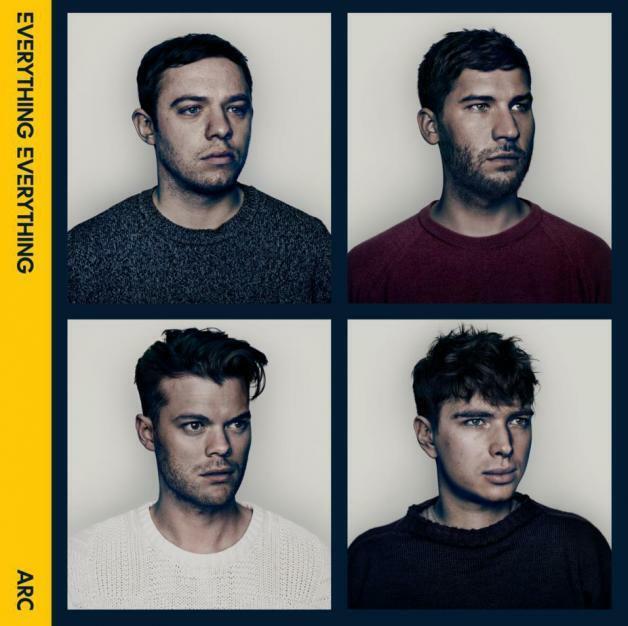 Everything Everything are the kings of mimic in this instance, and it’s an impressive level of authentic production they manage to wrap this track in. The most experimental track on the record is the minimalist ‘The House Is Dust’. It grinds along with guitars reminiscent of early Cure. Higgs is really giving his vocals a workout here, and it’s so bonkers it sounds like Kate Bush might have had a hand in its construction. It’s beautiful in parts, and touching, but something is lost in hearing this very tender piece in among the madness of the other tracks. The contrast is almost too great, and it feels a little indulgent. Nearing the end of the record, ‘Radiant’ chimes in bringing more familiar territory for Everything Everything. This could almost be a track from the ‘Man Alive’ sessions. As the tune develops, melody and riffs build into a huge anthem. I would imagine this would be a solid close to their live act. Penultimate ‘The Peaks’ is one that will divide fans. Another epic ballad, this track brims with drama and that trademark falsetto vocal. The vocal is too much by this point. It detracts from the lyrics, and it really isn’t needed. This is probably one of the most serious tracks on the album and Everything Everything are really going for the big epic ending. Sadly, I think they’ve overcooked it. Last track ‘Don’t Try’ leaves us with more familiar ground. It’s more stop-start quirky pop, which is light enough to sing along too, but crazy enough to stay interesting. It illustrates beautifully what this band is capable of; unconventional pop, with a sprinkle of madness to make something so sublime and interesting you will definitely be listening to the record again. I didn’t think this would be that ‘difficult second album’ for Everything Everything, but it sounds like [in parts] it might have been. I loved ‘Man Alive’ and thought they were so brimming with ideas and directions that this one would continue with more of the same. And that’s exactly what we have here, and they’re great at what they do. The only thing which has soured this record for me slightly is the emphasis on the falsetto vocal, and the obvious need to write these huge epic sounding, very serious ballad pieces. I would hate for them not to try new directions, and only do their trademark quirky pop, but by the same token I’m not sure this is an area I would want them to continue developing into. I would like to see them concentrate on what they do well, and develop sonically, rather than changing their writing style or their song construction. It feels as if they doubt their own credible act and are overcompensating with ‘serious’ epic ballads to give weight to their art. This is not required. This is an amazing album, and this is not a bad review. I loved their first record so much, and I really care about hearing more from this band, hence I feel I can really put them under the microscope. I have absolutely no doubt that any wrongs of ‘_Arc_’ will be addressed when we next hear from them. It’s a record that has moved me, angered and annoyed me, made me dance, sing in the street, and ultimately made me think, which is exactly what I want from Everything Everything. This entry was posted in Everything Everything and tagged _Arc_, Arc, Everything Everything, RCA by admin. Bookmark the permalink.